I may be the only blogger taking part in the Fab Four Friends blog tour who is not a major Beatles fan. I enjoy the music, respect the musicians, but never wanted to marry Paul. 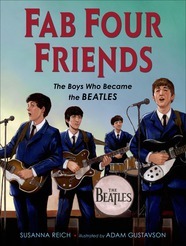 I was very taken with the Fab Four Friends: The Boys Who Became the Beatles by Susanna Reich with illustrations by Adam Gustavson, but not because I think the next generation absolutely must be exposed to these musicians. Instead, I liked Reich's portrayal of "the boys" training themselves to live a life with music. Reich writes about John Lennon rehearsing in his mother's bathroom with some "mates." "...pounding out souped-up folk songs and some rock 'n' roll. They had no idea how to play, but they loved making noise--lots of noise!" He met Paul McCartney when Paul saw him playing at a church fair. John was impressed because Paul could tune a guitar correctly. The two of them got together "bashing away" on guitars. "Most of the time they tried to imitate the hard-driving songs on the radio." "If only they could figure out the chords!" George Harrison seems to have been better at working out those. "...he knew a lot of chords." When he came into the picture, he taught them to John and Paul. Reich also covers the Hamburg (still pre-Ringo) period. To digress, just a little, Malcolm Gladwell writes in Outliers about the significance of Hamburg for the Beatles. The many hours of performing, he claims, contributed to the thousands of hours of practice he believes is necessary to become proficient at a skill. When they left Germany, Reich says, George was only seventeen years old. They had put in all that time and effort when they were still what most of us would consider kids. Fab Four Friends is for young readers, and the title itself is all about youth. "Friends," is one of the biggest concerns of childhood. "Boys," is a state of childhood. What I like so much about this early Beatles' story is that it addresses how hard these guys worked while they were very young. Yes, they were still young when they became successful. But the success didn't come until after they'd worked. They didn't just toss up the 1960's version of a YouTube video and become international stars. This picture book group bio is probably most appropriate for older gradeschoolers. However, I wonder if it wouldn't also be a good choice for reluctant readers on the middle school level. Tomorrow's stop for the blog tour will be at Tales from the Rushmore Kid. You can catch everything Fab Four here. Correction: This post originally stated that both George and Paul left Germany because the authorities there found out they were under 18. Only George went back to England for that reason. Looks like a fun read! I think about things like how bands come to be, now that I have one basically "in residence" in my basement. Two 11-year-olds and two 13-year-olds. They "bash around on guitars" and drums. It will be fun to see what paths they go down in life. I agree. I think it is a very good idea for children (and even adults) to learn what is involved in building a successful career in the arts. Nancy, the Beatles seem to have come early to that teen band model for getting together and learning music. Maybe they created it. Leanne, Over the years, I've had some teachers and students ask me about children getting published. A few years ago, I heard grade school kids .talking about self-publishing, and I've certainly read about teenagers wanting to do it. So this book definitely seemed to me to be a healthy response to the belief that you can skip the work and write or perform.